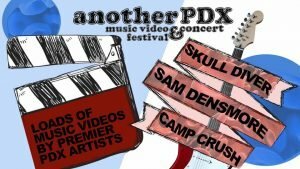 Another Portland Music Video Festival and Concert is an All Ages event set to feature 1.5 hours of Portland Music Videos from a variety of premier Portland Music Artists followed by three amazing bands – Skull Diver//Sam Densmore//Camp Crush! Portland needs more all ages music related events. Another PMVF is a great way for music and video artists of all ages to share their work in a fun, local festival style environment. For artists, Another PMVF is free to apply to and participate in.